Quentin Tarantino’s Kill Bill saga concludes with a profound and challenging second volume that is sure to be divisive. I question how many viewers will welcome Vol. 2‘s abrupt shift into more solemn and mature territory after Vol. 1‘s mad rush of heady juvenilia. Having established his heroine, The Bride (Uma Thurman), as a wet-dream superwoman, Tarantino proceeds apace to break down her fantasy. This time out the fight scenes are fewer and farther between; when they come they are quick, brutal, and exhausting. Compared to the lighter-than-air surrealism of The Bride’s Vol. 1 battles with homemaker Vernita Green (Vivica A. Fox) and yakuza O-Ren Ishii (Lucy Liu)—set, respectively, against dreamlike suburban and Japanese snow garden backdrops—her Vol. 2 encounters with trailer-trash redneck Budd (Michael Madsen) and one-eyed Elle Driver (Daryl Hannah) are grounded in more unforgiving western landscapes. Certainly there’s an East-meets-West thematic backbone to the Kill Bill saga, one that Budd nearly shatters when he wounds the Hattori Hanzo sword-wielding Bride with rock-salt bullets. For a character previously viewed as unstoppable (having effortlessly slashed her way through an 88 man strong Japanese mafia) this turn of events comes as a rude cultural awakening. The narcotic lull of Tarantino’s romanticized Japan and candy-colored American suburbia evaporates in a shotgun flash and a harrowing point-of-view burial. As The Bride comes closer to her titular goal the stakes are raised and the opposing moral forces that haunt her one-dimensional, vengeance-fueled quest slowly reveal themselves. It’s quite possible that what made the standalone Vol. 1 initially unsatisfying was its lack of this moral shift. Though it was a colorful and energetic entertainment there seemed few pleasures to grasp beyond the ephemeral. The reportedly economic choice to halve a film conceived as an epic whole may have caused more harm than good in the short run. Taken on its own, Vol. 1‘s adolescent frivolity attracted as many vocal naysayers as boosters, and it’s likely that Vol. 2 will disappoint a majority of both camps because they blindly expect more of the same. Hindsight and retrospect should rescue Tarantino’s magnum opus for the ages. Until then, Kill Bill‘s two volumes more precisely represent a fascinating thematic obsession with doubles. Aside from the films’ contrary ambiences—which we might term excess vs. focus—this principle of twos reveals itself in Tarantino’s casting. The most explicit examples are the dual roles played by Gordon Liu and Michael Parks. The mere presence of these cult icons personifies Kill Bill‘s East/West dichotomy, while their differing characters embody a North/South split. Liu moves from Vol. 1‘s Japanese henchman Johnny Mo to Vol. 2‘s Chinese martial arts master Pei Mei; Parks, meanwhile, plays a Texas sheriff in the first installment and a Mexican pimp in the second. 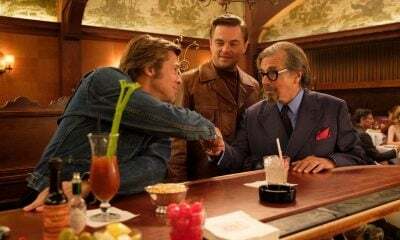 Carefully placed at specific narrative points, one role poetically rhymes the other—the effect is, at the very least, subconsciously noticed and contributes to Tarantino’s political sense of the current world’s blurred cultural divides. From a structural standpoint, Kill Bill‘s two volumes connect us to serial cinema past, specifically the two-part films of Fritz Lang. Dr. Mabuse: The Gambler, The Nibelungen: Siegfried and Kriemhild’s Revenge, and The Tiger of Eschnapur/The Indian Tomb are just a few of the great German director’s complementary epics. Both parts are typically of a similar duration and the end result is a mathematically precise narrative arc—you can almost feel Lang’s flawlessly wrought storytelling wavelengths. Kill Bill is slightly less successful in terms of cinematic shape. It’s a mess at times, but a seemingly intentional and glorious one. Certainly Tarantino’s greatest skills are literary and his numerous digressions recall the stylistic flourishes of author Thomas Pynchon. When Tarantino abandons The Bride in her premature burial deathtrap to focus on an extended flashback of her martial arts training, it’s reminiscent of Pynchon’s nine-page aside in Gravity’s Rainbow, which details the biography of a light bulb named Byron. If that comparison makes Kill Bill sound like so much compulsive masturbation, rest assured that Tarantino has a point. Consider the movie’s two volumes as yin and yang—the first installment, focusing primarily on The Bride, corresponds to the Chinese principle of darkness, negativity, and femininity; the second, its tone heavily influenced by the charming and seductive Bill (David Carradine), corresponds to the opposing principle of light, heat, motivation, and masculinity. Tarantino revels in the filmic power of pas de deux‘s both verbal and (meta)physical, and it is in the final section of Vol. 2, detailing The Bride and Bill’s surprising confrontation, that the entire enterprise reveals its profoundly mortal (and moral) soul. In this sequence, Tarantino subverts our expectations of out-and-out swordplay, focusing instead on lengthy verbal sparring. His affection for the French film master Eric Rohmer shines through in Bill’s monologues, all of which build in the course of their referents and metaphors to sublime epiphanies. Carradine clearly relishes the role, but not to the self-conscious extent one fears would have resulted from Tarantino’s original casting choice: Warren Beatty. The actor’s expert wordplay is matched by Thurman’s silent, mythical stoicism—this is a performance of intense corporeal purity, one that traverses realms both divine and mortal. From victim to goddess to mother, the actress speaks emotional volumes through the simplest physical movements. Kill Bill is a career high for both actors, one that Tarantino (truly cinema’s Jekyll and Hyde) climaxes in a literal moment of heartbreak. As in the penultimate cemetery scene of Pynchon’s comparably rambling novel Mason & Dixon (where a distraught, lost-for-words Charles Mason stands silently over Jeremiah Dixon’s grave), this singular instant effectively clarifies and informs all that came before. 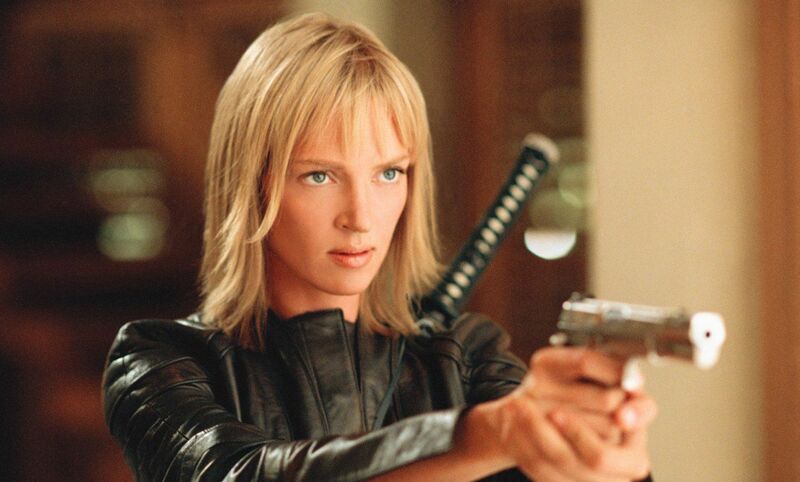 Tarantino’s pop-culture laden revenge saga then comes full circle, replicating Vol. 1‘s extreme close-up, black-and-white opening in harsh Technicolor. Only this time The Bride is alone with her thoughts, a goddess fallen to earth, lost in a haze of tears, laughter and, finally, prayer.